I was wondering how to refer someone to a proposal, because I was on this proposal and some people have referred people but I don't know how? And since I committed to the proposal I am suppose to help by referring and stuff. If someone follows your referral link and then follows or commits to the proposal, you will earn some reputation, and that person will be marked as having been referred to the proposal by you. 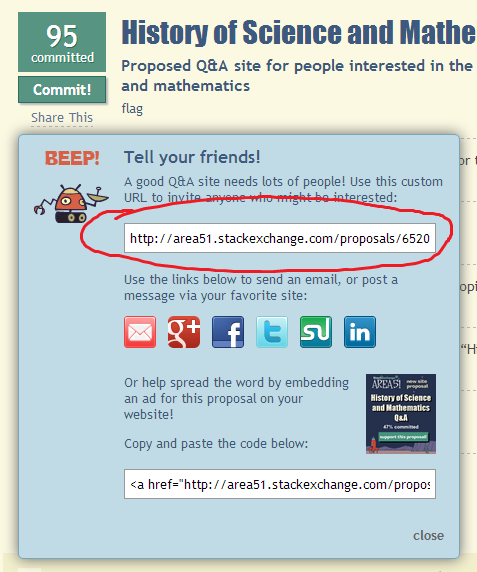 Of course, if you don't care about getting reputation for referrals, you can just share the link to the proposal by copying it from the address bar: http://area51.stackexchange.com/proposals/65204/history-of-science-and-mathematics. Not the answer you're looking for? Browse other questions tagged area51-meta commitment support . When do you get your commitment back? How do I uncommit from a deleted proposal? Would a proposed site stucked in Beta get closed? I accidentally committed to a site as an unregistered user - how can I undo this? How did someone manage to get a hold of my email address? How can I be more helpful on Area 51?